Fairboroughs Farm is first recorded in 1230 in the writings of the Cistercian monks who owned Dieulecres Monastery which was situated off the present day A523 near Leek. The Monastery was destroyed and cleared in the 1530’s during Henry VIII’s reformation of the Catholic church. Fairboroughs was in fact a Grange which meant the monks worked the land as they did all the area of Leek. The ‘White Monks’ as they were known because of their undyed white habits were originally from France. They were sheep farmers in many areas of England including Fountains Abbey in Yorkshire. They owned all the areas around Leek and were very wealthy. The outside of the buildings gives few clues to the age of the farm. There are not many visible features but there is definite architectural evidence in the fabric of the house that there was once a medieval dwelling here. The stone buildings including the house and Wren Cottage are mainly 16th and 17th Century. As a consequence of the farms significance it is Grade 2 listed and is also featured in the Victoria History of North Staffordshire because of the information available from such an early date. Over the centuries, many families have lived and worked on Fairboroughs Farm. However it is understood that the Lowe family are the first owner occupiers of Fairboroughs Farm since the Monks farmed here. Equally the farm itself has undergone many transitions from sheep farming to mixed dairy, beef and sheep. Currently, it is principally once more a sheep farm (with some chickens, dogs, cats, horses and calves for good measure). Mr William Lowe and his wife Kathleen purchased Fairboroughs Farm in 1966. Since that time Grandfathers, Fathers and Sons have grown and worked alongside each other. These days it’s the great grandchildren of William and Kathleen you will meet playing on the swings or plastic tractors around the farm. 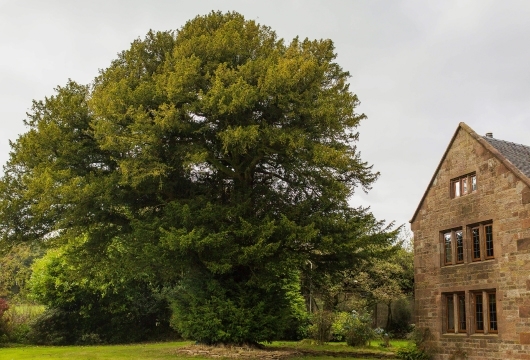 At the front of Fairboroughs Farmhouse stands a beautiful old Yew tree. Thought to be in excess of 1000 years old. It has stood and watched the comings and goings of families and visitors for centuries. If only it could talk, what stories might unfold. Linger a while in the footprints of the past and ponder the people and lives before.